This week’s guest blogger is Ocean Unger, a ten year old from Clearwater, Florida, USA. She wanted to write about her how experiences encountering lemurs at a zoo inspired her to learn more about lemurs, and want to do her part to help protect them in the wild. She hopes to inspire other children to realize that even at a young age, they can funnel their love of wildlife into actually making a difference. I first started loving lemurs when I went on my fourth grade class field trip to The Giraffe Ranch in Dade City, Florida. We got to see a bunch of cool animals and have encounters with wildlife. We saw a rhinoceros get a bath. We fed the giraffes. And an ostrich came right up to our bus. But my favorite encounter was with the ring-tailed lemurs. They were sweet and funny. As we left, they all sat in a little circle like meditating buddhas. Later I learned that they were just sunbathing! There was a small lemur named Tiny Tim. He was born with a condition that gave him seizures and was unable to nurse. Thankfully, with care and the right nutrition, he has grown and is doing much better since my visit in the spring. Since my visit to The Giraffe Ranch, I have learned all about lemurs and how lemurs are Endangered. I spoke with Elena Sheppa, owner of The Giraffe Ranch to ask her a few questions. She told me that all the lemurs at The Giraffe Ranch were raised in human care. They are fed a diet of fresh fruits, vegetables and primate biscuits, which gives them all the nutrition they need. They will never go to the African island Madagascar, the only place in the world where lemurs live in the wild. But Elena thinks they have an important role here in Florida. The lemurs of Madagascar are one of the most endangered animals in the world. Because of the destruction of the tropical rainforest due to illegal logging and hunting, they have been pushed to the brink of extinction. Lemurs got their name from the word lemures, which means ghost or spirit in Roman mythology. You can help keep them from becoming ghosts by supporting conservation efforts in Madagascar, volunteering, donating to wildlife organizations, or spreading the word through social media and blogs like this one! The indri lemur is a sacred species in Madagascar and is considered to be the ancient “brother” of humans. By helping the planet, and helping its endangered species, we are really helping ourselves — because from Florida to Madagascar we’re all connected. Save our brothers the lemurs of Madagascar! 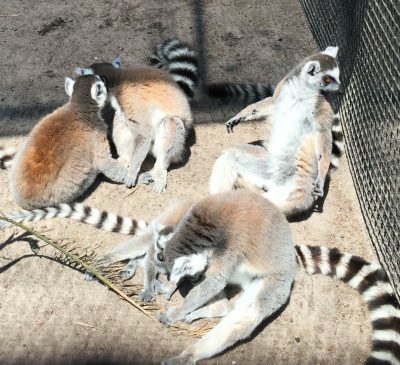 Find a local zoo that houses lemurs to discover your own inspiration. Many zoos are Lemur Conservation Network members.